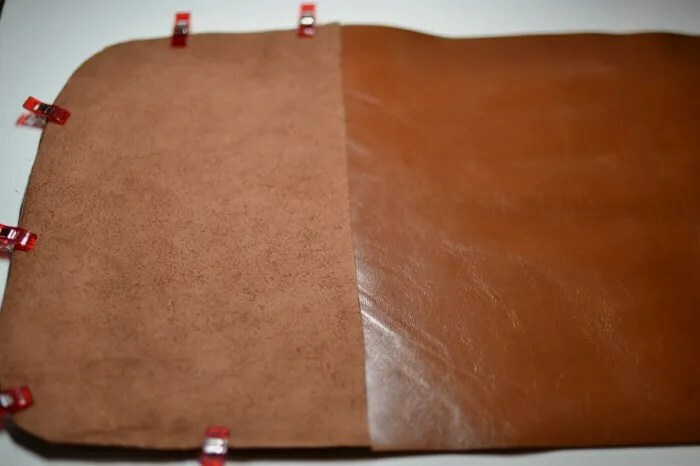 Awhile back, I was contacted by the Leather Hide Store, asking if I wanted to sew something with their leather. After taking a peek at their website, I got pretty excited. So. Many. Options. I settled on Dark Copper Mountain Saddle, and they sent me a remnant. And when I say remnant, I actually mean a super ginormous piece of leather. You guys, this leather is ahMAYzing. Seriously, the smell…. ahhhhh. SO fantastic. It arrived right before Christmas, so I decided to make a notebook cover for my brother [who is now a lawyer, so obviously needs fancy-pants leather notebook covers] and liked it so much that I made one for my husband too. Did I say husband? I meant me. Sorry, honey. or a leather needle helpful [affiliate links]… I didn’t have either of those on hand, but had no problems. You may also find it helpful to make a mock-up of your cover out of felt. I got this tip from Jodi, and I used the felt to decide how big my leather pieces should be, without wasting any leather in the process. 1. 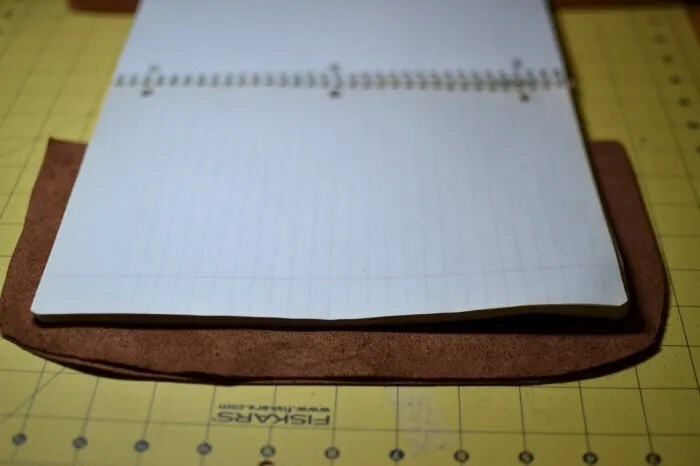 Lay your notebook out flat and cut around it, leaving about an inch of seam allowance around the entire notebook. This will give you one long rectangular piece of leather. You can curve your corners or leave them square. 2. Cut two pieces of leather that will be the inner pockets. 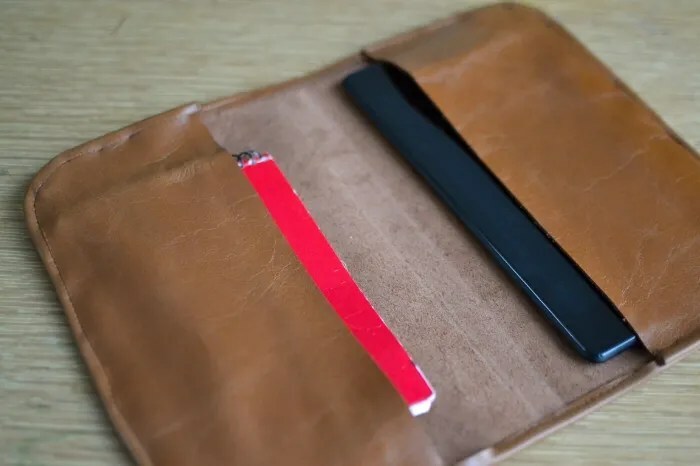 These should be about two-thirds as long as your notebook , with the same one inch of seam allowance all around [as you can see in the picture above] Use your long leather piece as a guide, so the leather pieces match up and are the same size. 3. Place the leather pieces right sides together, with one pocket piece on each side. Do not pin the leather together. Use binder clips or Wonder Clips [affiliate link – but I seriously love these things] to keep the pieces together. 4. 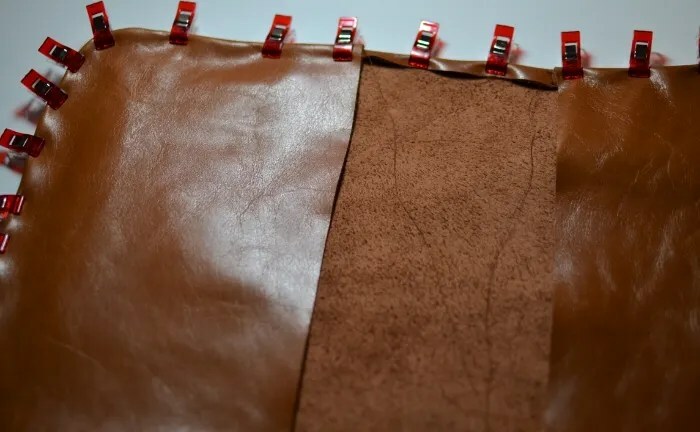 Slowly sew only along wrong side of both pocket pieces – you’ll sew in a U shape and stop when you reach the end of the pocket piece [do not sew where there is only one layer of leather]. Sew with a 1/4in. seam allowance and trim the seam allowance a bit when you’re done. But don’t trim too close to your stitches! Leave more seam allowance than I did in the picture above. 5. 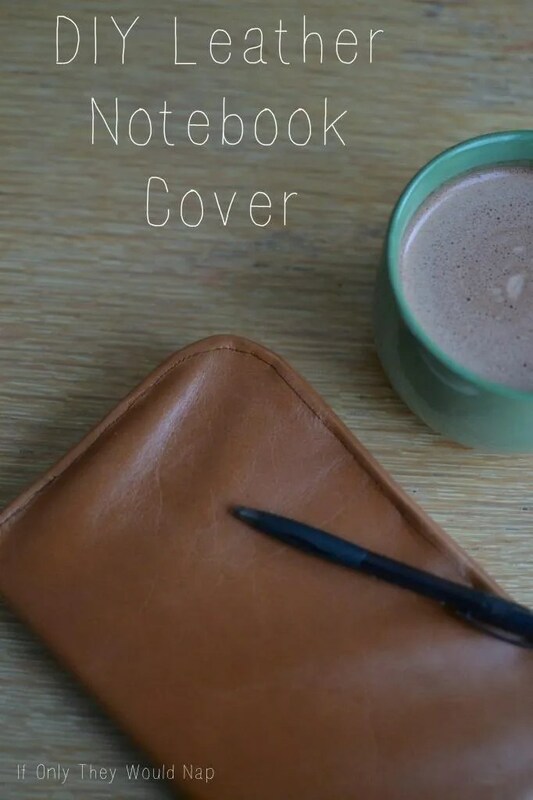 Now carefully turn your notebook cover right side out. Press the corners out gently. Clip all around the edges, including the center, folding over the one layer of leather. Then topstitch slowly around the entire notebook cover and trim your loose threads. Don’t be afraid to sew with leather! Just remember to go slowly. Lengthening your stitch may also help. Also, the leather from the Leather Hide Store sews like butter. Well, better than butter, because what kind of crazy person tries to sew with butter…. leather inspiration and DIY tutorials! 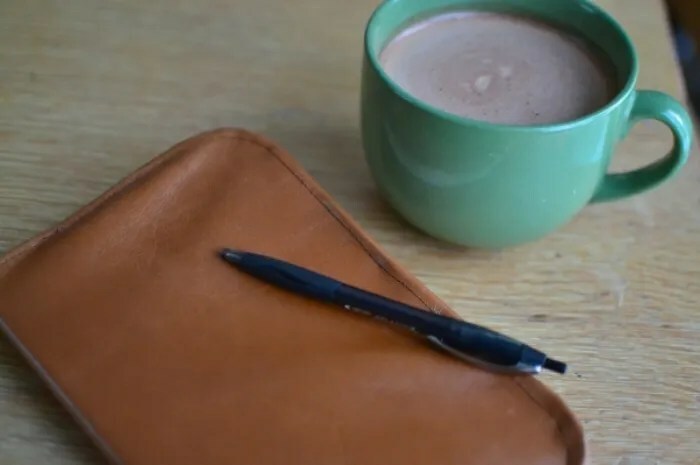 You can also use your notebook cover to carry a tablet or e-reader, protecting it from scratches. 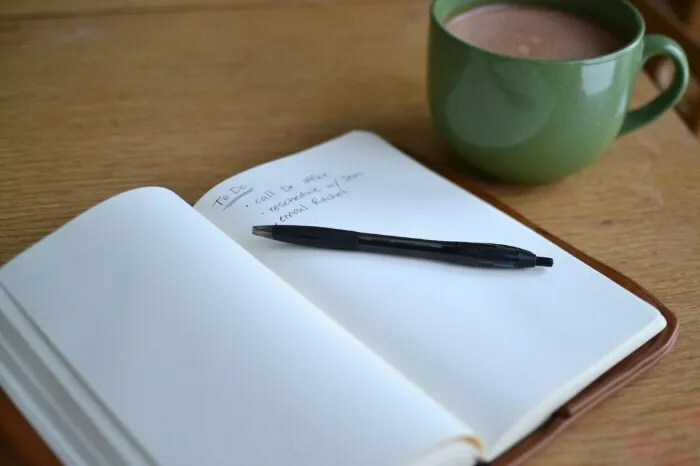 Slip a small notebook in the other side if you’re like me and need to do all your list-writing on actual paper. Obviously I’ll be using mine at the coffee shop… or in my house pretending I’m at the coffee shop and hoping someone doesn’t spill my coffee all over my fabulous leather. Leather Hide Store is giving away a $50 gift certificate to one of my lucky readers. The giveaway is open until 8pm CST 1/19. Click here to enter the Rafflecopter giveaway for $50 to the Leather Hide Store! Disclosure: Leather Hide Store gave me leather for this project, but all opinions about the leather are my own. I think I would buy the ES#21-a ONYX BLACK. My husband wants a tool roll for his motorcycle but can’t find one that he likes and he casually asked if I could make one! I love the firehouse red leather! I think I’d go for a nice, soft leather in red. 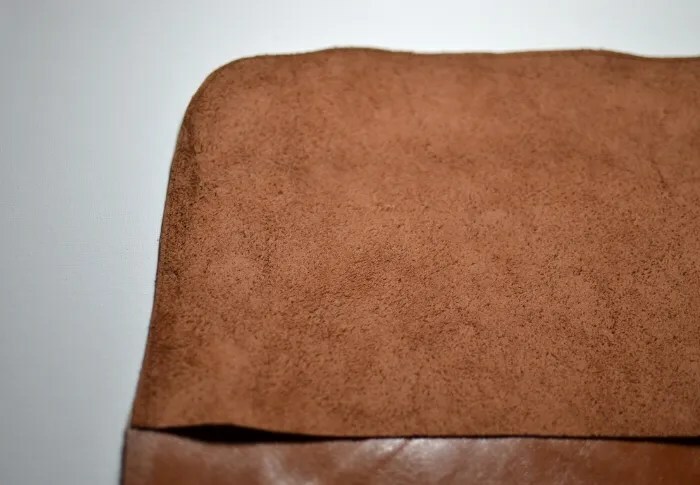 Must have Autumn Blaze leather…oooooohhh… LOVE the smell of leather, I can think of so many fun things I would want to make!! Thanks for the great resourse!! These would make great gifts for men or women! Hope I win the gift card so I can buy more leather to make some! This looks so great Jess. Thanks for the chance! Such a great (and quick) gift idea. I know so many people in my life who could use one of these. And the Leather Hide Store is amazing. So many great shades. 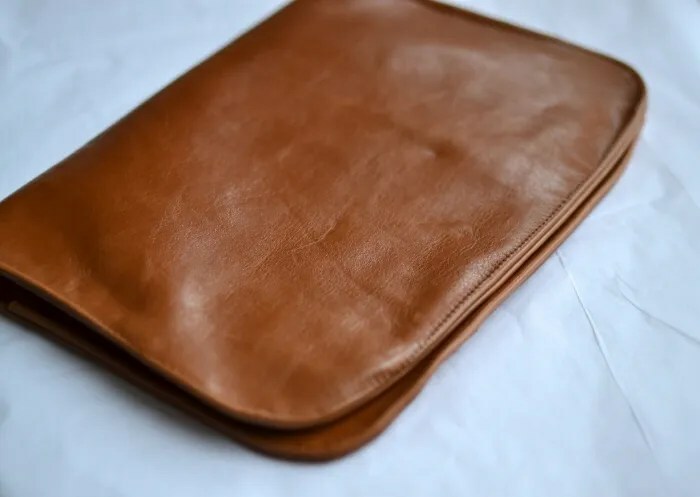 I haven’t tried using leather, but really interested to use it to make a bag. This would be perfect trying on leather with my machine. there are so many to choose from but I think I may get the MANHATTAN GREY! if I win… it is so fun! I have been wanting their dark copper mountain saddle leather for a while now! I have a slight obsession for baby shoes so I would make a pair or five if I win! I like the Hollywood Red and the white. oooh, chicago camel. thanks for the giveaway!!! I’m just going to venture into my first leather sewing adventure! Durango DK Gold…or any hair on hide when available again! I love this project! And thanks for the tip on where to shop for leather, I have been looking for an online place! I love the dark brown and black leathers… classic! I want to try black leather!! I’d make a gorgeous computer case! SO fun to work with leather! Pingback: Handmade Holidays Nov. 14: Gifts for Naturalists | Sew Mama Sew | Outstanding sewing, quilting, and needlework tutorials since 2005.